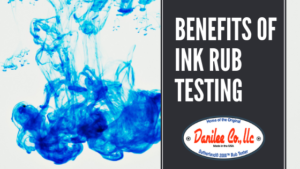 Benefits of Ink Rub Testing | Sutherland Rub Tester | Danilee Co.
Labels are very important for all products, including safety products and electrical products. It’s important that the labels are durable and long lasting because of the important information that the label contains. An ink rub test is usually performed on all labels to ensure that they are durable enough to stand the test of time. The benefits of ink rub testing are that it helps enhance product safety, ensures compliance with international standards, and provides long lasting product value. What is an Ink Rub Test? An ink rub test is a test of a label whereby a label is rubbed against an abrasive. It might be rubbed several hundred times and afterwards the label is inspected for readability of the information on the label. Different fluids can also be employed like such as alcohol and even soaps. While testing is usually done for equipment where the label is integral to safety, any product label or even brochure can undergo rub testing. This testing can be used in any application where it’s important that the ink does not fade away due to abrasion. An ink rub test is performed on purpose built machinery like the Sutherland 2000. Results from the ink rub test are important for ensuring that the product meets accepted standards. One benefit to ink rub testing is that product safety is enhanced. Important product safety information is printed on labels. In machinery, labels contain information like the electrical rating (voltage and amperage required), warnings, the model number, and even basic usage instructions. These need to be viewable for the life of the machinery or serious safety problems could arise. If this information is not easily available to operator then a product safety situation can arise. This might create liability for the product manufacturer or user. An ink rub test can ensure that the label is durable and that due diligence has been performed. Compliance with national and international standard, like the IEC, means that an ink rub test is of paramount importance. Meeting these standards can be the difference between entry into a market and languishing in international purgatory. These standards are serious when it comes to label durability. The UL has high standards when it comes to labeling and ensuring that the label doesn’t fade away. It’s understood that being informed about a product is the first step to keeping safe. That’s why their standards call for a certain level of product label durability. This durability can only be proven by performing an ink rub test. A third ink testing benefit that can’t be overlooked is that it enhances product value. Putting a label on a product is a source of pride for a job well done much like the way an artist will sign his paintings. Part of the value of any product is its resale value. A high resale value is a genuine selling point. A quality, durable label is often viewed as a mark of quality when looking at a product, especially several years down the road. An ink rub test will ensure that the product’s label will last for the life of the product. This value enhancement is carried with the product. Ink rub testing is the only way to show that your label is durable and will hold up to the rigors of the environment where it will be used. It enhances your product’s safety, it ensures your product complies with standards, and it enhances your product’s value. It’s the right thing to do.